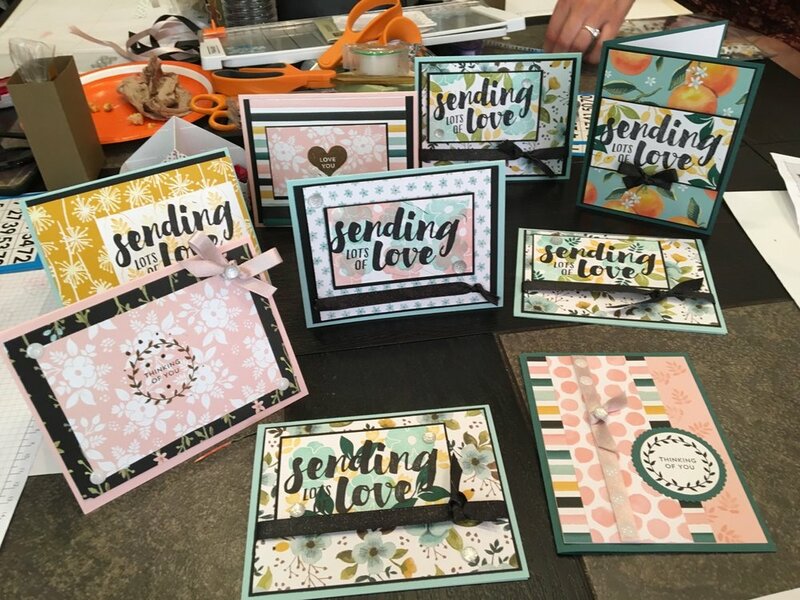 Today's post is all about the make n takes I created featuring the Whole Lot of Lovely Suite (page 86-87 in the annual catalog). I ended up making two examples for the ladies to choose from. My first card featured the large sentiment from the Lots of Love stamp set. I love good sentiments and this one was perfect! After stamping the sentiment, I added some stamped flowers and leaves onto the background to echo the DSP. I finished the card with a few faceted gems and a piece of ribbon. Both the gems and ribbon sparkle a bit. The second card was a bit more simple in visual design. I stamped some random pieces onto the Powder Pink CS and then added some great patterned paper. I didn't want to distract from the card, so I just added a simple sentiment piece. And here are all the great cards the ladies made during Bingo. I love how everyone's cards are so different. I love seeing what the ladies do with my original designs.